My mother called while I was out for a million-hour brunch with friends. I jokingly asked one of them to answer the call, and they all – a little too eagerly – leapt at the chance. I had to wrest my phone away from Gill so I could force the call to voicemail. It’s not that I don’t want my friends to talk to my mother; rather, I was saving myself from the inevitable 3-hour conversation later this evening trying to explain to her who those people were, why they were talking to her, and just how did they know about the bucket. 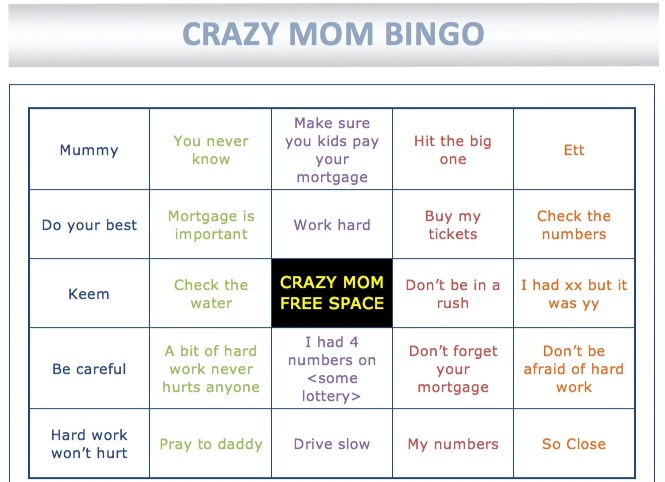 Now I can’t WAIT for our phone call – I wonder what would happen if I yelled out BINGO! halfway through our conversation.